Let me just start by saying that Gary Saperstein and Mark Vogler know how to put on a world-class event and Out in the Vineyard's Gay Wine Weekend is bound to be the "can't miss" annual event for the LGBT community in California Wine Country. 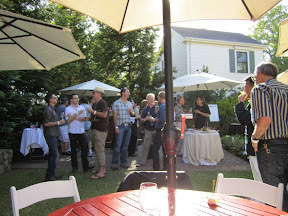 The First Annual Gay Wine Weekend was held June 17-19 in Sonoma. The weather, the events and the setting couldn't have been more perfect! Over 300 people attended the various events, starting with the VIP Reception at MacArthur Place on Friday evening. Not only were there three great wineries pouring at this event - Poem Cellars (whose Cab Franc was among my favorites of the whole trip - more on that in a future post), Highway 12 and Westwood - there were also tasty hors d'oeuvres and cocktails provided for those in attendance. As we left the event we were also handed a fun schwag bag that had items from the various sponsors. After the reception, "An Evening of Gay Comedy" was held to benefit the Sonoma Community Center, headlined by the very funny Judy Tenuta and featuring four other comedians, the evening was filled with laughs and helped raise much needed funds for a very worthy cause. Saturday was all about wine tasting. Many of the participating wineries were offering tasting and wine specials, so we headed out to take advantage of those! Our day began as every day should, with bubbles! 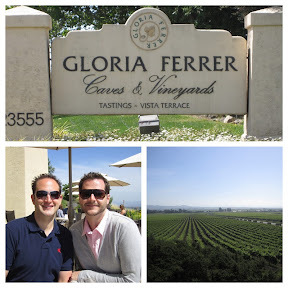 Gloria Ferrer was offering complimentary tastings to Gay Wine Weekend All-Access VIP ticket holders. The grounds, views and winery are spectacular. We sat on the outdoor patio and enjoyed three different sparkling wines. Our group's favorite was the 2002 Royal Cuvee, which for $32/bottle, it is a very solid sparkling wine. This 67% Pinot Noir and 33% Chardonnay bubbly has received critical acclaim, as well as five Gold Medals at various wine competitions across the country. After enjoying the patio and bubbles at Gloria Ferrer, we headed to the much anticipated and highly recommended "Mountain Top Tour" at Kunde. Although they weren't a participating winery, we were told it was a can't miss, with views of the Sonoma Valley that are second to none. 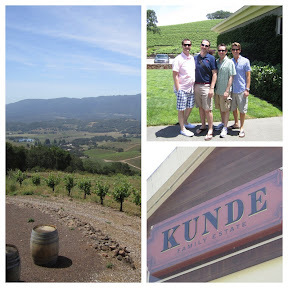 More on Kunde in a future post. After two great tastings and the tour of Kunde, it was time to stop by one of Sonoma's most beloved restaurants, the girl & the fig. Opened in 1997 by Sondra Bernstein, the girl & the fig is a must for anyone visiting Sonoma. Located in the historic Sonoma Square, it is the perfect lunch or dinner spot. The rustic French inspired menu has something for everyone and the freshness and quality of the food is truly something special. "dark, rich flavors of blackberry and raspberry with a rustic, spicy tobacco finish. Soft tannins slowly unveil an earthy quality, reminiscent of a redwood forest floor, while toasty oak essence wraps around all the flavors for a savory, evenly packaged wine." 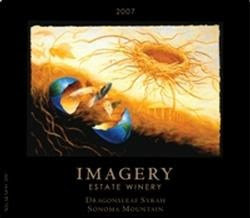 Imagery was a great way to finish the day of tasting and I look forward to opening that bottle of Dragonsleaf Syrah soon. 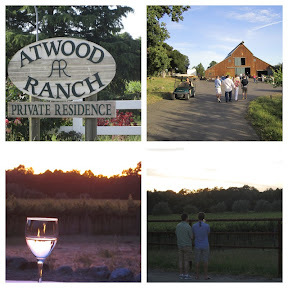 It was then time to head to the spectacular Atwood Ranch for the Twilight T-Dance. To say that this venue is gorgeous, doesn't do it justice. The evening began with a VIP reception on a beautiful patio, with wines being poured by Sojourn Cellars and Audelssa - my favorite of the bunch was the Sojourn Cellars Spring Mountain Cab - hoping to get some soon, so I can write more about it. Following the reception, everyone was ushered down to the barn for an evening of wine, food and dancing. Wine was being poured by a dozen different participating wineries and to pick a favorite out of the bunch would be nearly impossible. The very generous support of Benzinger Family Winery, Imagery Estate Winery, Eric Ross, Deerfield Ranch Winery, Muscardini Cellars, Enkidu, Loxton, B Wise Vineyards and Keating Wines at the T-Dance, made for a very fun night with some really great wines. Additionally, the food truck round-up provided options to fit everyone's taste and some great grub! Despite all of the great food, wine and being able to spend time with friends and make new friends, the highlight of the evening for many was the spectacular sunset. It couldn't have been more perfect and many joked that those putting on the event did quite an amazing job staging the sunset for the event. 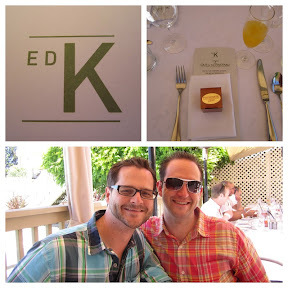 The Big Gay Brunch and Wine Auction on Sunday morning closed out the weekend with a bang. Hosted by El Dorado Kitchen, the event was filled with Mimosas, Bloody Mary's and laughs, as the 60 or so people in attendance bid feverishly over several wine lots and a wine country experience, with all proceeds benefiting Face to Face, Sonoma County AIDS Network. To say the weekend was a smashing success is an understatement. And to think this is just the beginning of what Mark & Gary have in mind for what future Out in the Vineyard events will look like, I am already anxiously awaiting June 2012. Looks fab. I'm def coming next year. so glad you and Michael were able to join us! Next year will be even bigger!